SNHR said today that no less than eight massacres were perpetrated by the parties to the conflict in Syria in the month of November. This report draws upon the ongoing monitoring of news and development by SNHR team, and on accounts by survivors, eyewitnesses, and local media activists as the report contains two accounts that have been collected by speaking directly to eyewitnesses and are not cited from any open sources, in addition to analyzing a large number of videos and pictures that were posted online or sent by local activists. According to the report, November saw an increase in the number of massacres compared to the previous three months, with the second half of the month seeing an escalation in the bombing by Syrian regime forces in the Idlib de-escalation zone. 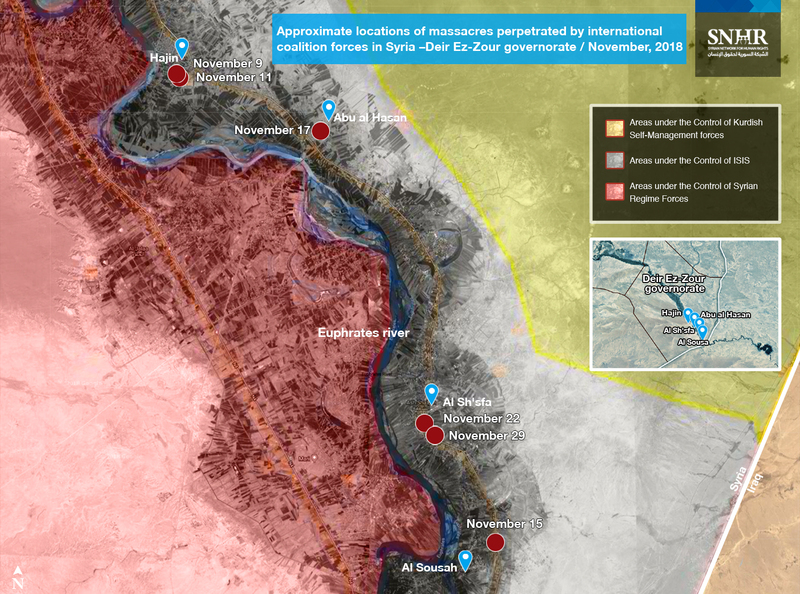 The report also recorded a continued escalation of attacks by the international coalition forces in the areas controlled by the ISIS in Deir Ez-Zour governorate for the second consecutive month. The report noted that the massacres committed in November resulted in the death of 54 children (60 percent of the total civilian casualties), including 39 children killed in Deir Ez-Zour by international coalition forces. The report documents no less than 219 massacres that have been perpetrated by the parties to the conflict in Syria since the start of 2018. In addition, the report records no less than eight massacres in November. The report uses the term “massacre” to refer to an incident in which five peaceful individuals or more are killed in the same attack. Based on this definition, Syrian regime forces were responsible for one massacre in November. Additionally, the international coalition forces were responsible for six massacres, while the report records one massacre by ISIS. According to the report, the massacres documented this month have resulted in the killing of 86 civilians, including 51 children and 19 women (adult female). This means that 82 percent of all victims were women and children, which is a considerably high percentage, and an indication that civilian residents were targeted in most of these massacres. The report breaks down the death toll of the massacres, as nine civilians were killed in the massacre by Syrian regime forces, including seven children and two women. On the other hand, five children were killed in the massacre perpetrated by ISIS, while the international coalition forces killed 72 civilians, including 39 children and 17 women.